Corporate image and logos – so, which comes first? The logos and presentations of familiar products and services seem to change rapidly. Why is this? Why don’t they stay with the familiar? In the main some tweak their images from time to time in order to keep up with changing design mores. Others, however, need to introduce a co-ordinated image in order to have one in the first place. This compliment slip is intended to reflect a more modern organisation than did its previous design. 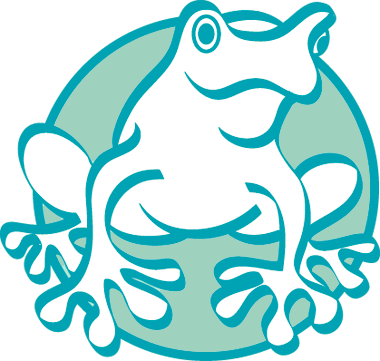 Based on the organisation’s idea that they needed graphics which would reflect a particular breathing technique used by their patients, they asked for a strong visual logo, and suggested a frog. From this idea, the concept was taken forward to a more sophisticated design. The frog below is the first conceptual sketch for them and can be seen to have a different, perhaps friendlier, character from that above. It is commonly thought that a change of logo will demonstrate a newer image, one which is more up-to-date and, by extension, more valuable or useful to the organisation owning and using the logo. It is even thought that the introduction of a new logo will signify a real change in the attitude of a company. Perhaps British Airway’s native art tailplane designs were the most famous of these. Introduced at great expense they were changed back a few years later, again at a cost of millions to the company. Some of the designs were excellent and, as a group of artworks, made quite an impact, but somehow it seemed not to suit the airline’s image of itself. Most airlines have changed their image at some time or another, apart from American Airlines which has stuck with its Helvetica form. The larger the organisation, the more costly the exercise of changing everything associated with the image, something which is sometimes difficult to sell to shareholders but which can be of benefit to the company as it is able to change elements of its structure and behaviour by this process. But that’s another, longer subject. The process of designing logos is difficult when there is little to base it on other than a casual set of requirements from the client. Here the request was for a typographic solution with the preferred colour a strong blue with red accent to bring that colour out. It was to be applied to a number of items: both the usual stationery requirements – letters, envelopes, visiting cards, brochures, training manuals, web site and so on – as well as t-shirts, training bags, towels and the like. These were the initial designs were sketched out freehand and then quickly made using a drawing programme and discussed with the client, but were not progressed as the client decided on a different career path. For what it’s worth, there is only one I thought worth following up. But when the direction of the design is known, there may still be a considerable exercise in sorting out the balance of the design. The logos above may be contrasted with these studies for a visiting card. Although they may seem similar they vary considerably on study. The placing of the different elements of the card – the name, areas of expertise and web, email and telephone number – create the differences. And it is not just their placement that is important, but also their relative sizing, the character of font selected, the use of upper and lower case, the use of symmetry and asymmetry and the amount of white space; all are critical to the feeling the card will create in those who view it. 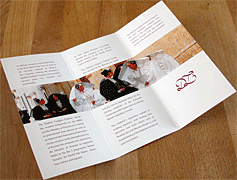 There is also no logo used nor is there the usual, necessary exercise in tying the visiting card and business stationery together. True change in a company is usually good. But it is often thought that a change in logo signifies a better company, and this is rarely true. When a change in logo reflects the real character of a company, then this really is useful, but is only likely to come from a bottom-up change in the company. Usually it is a top-down process as this is where those at the head of a company believe it should start or, more accurately, believe it has to start as they see themselves as initiating the change in the company. Management consultancy has it that change can not be directed from the top – but that is another discussion... The logo which evolves often bears no relationship with the company or its character, yet its design is a specialised service. I should mention that the frog design was eventually dropped as being too esoteric and the work of design resolved itself on producing a co-ordinated design scheme, the reason being the need to keep the name of the organisation, a title which doesn’t lend itself to incorporating into a graphic shape. The next three illustrations are of investigative designs made for three different companies. The first illustration shows a number of greeked letters set out with different types and characters of headings as the organisation was not clear about how it wished to project itself. Part of the difficulty lay in the request for a logo based on a very common pair of letters which should have no connection to any existing company. Three of the letters avoided the problem by using the full name of the company, but the other six all contained a trial logo in order to illustrate to the client how his company might look on paper. With each design were matching and alternative business cards. This illustration shows, for another company, how this was effected. Here the approved letterhead, on the right, is paired with two different ways in which the business card might be arranged. In addition to this there was also a coaster that was used, based on the left-hand business card. Generally it is not a good idea to have too many different ideas illustrating a company’s letterhead or logo but, sometimes it is necessary in order to obtain a better understanding in which the owner perceives the company. Here are six alternative designs for a different company, this time a more up-market oranisation whose image is reflected in the style of graphics, the fonts used as well as in the quality of the paper and the printing for letterheads, envelopes, compliment slips and business cards. Again, these were very different designs, intended to draw out information from the client. The two designs to the right show different styles for different audiences. The flier on the left advertises a music school which was in the first stages of being established. A concert for the school was the opportunity to produce a quick flier advertising the school. As such this is not a logo, but the seeds are there for developing one along the lines of the treble clef. The flier on the right is for Poi – originally a Maori martial art but which has developed into a form of display and exercise, now relating to juggling. Both are designed to be seen at a relatively close distance, and that on the right had to be very simply produced; hence the black and white design. This design was produced for a dance group to illustrate the character of their traditional dancing and give the basic contact details. A simple folded design, it was designed to stand on a mantlepiece or desk and, when folded, slipped easily into a pocket or handbag. It has to be said that a product is treated conceptually differently from a company and, more often, a logo can change to benefit the product’s sale relatively easily. If you look at the changes to, for instance, Shell’s logo – as well as a number of others – you may be surprised by the subtle changes which have been made with time, even though most people think they have been static designs for years. I should also add that changing logos can be an extremely expensive business when you consider the number of items on which it may be used, and which will need changing. Near right is a logo, made some time ago, which was developed as a simple calligraphic intertwining of two initials and was used on a wedding Order of Service. To its right is an over-developed logo I’ve been using for many years. The original changed with time, mainly in its colour and the refining of the outline, but essentially it is the same logo which has lasted over twenty years and which is used for my graphic design work. It works best when it’s simple. Here you can see a version of my original ‘Sleeping Cat’ design, left with, right, the up-dated and simplified version of the ‘Catnaps’ design. The principle involved in the change was to try to make the basic outline a simpler line. You can see there is still some way to go, particularly with the outline of the cat’s face which doesn’t work well at a small size. The four versions of a design for the catnaps logo placed above were not the only ones I made. Some time was spent developing this design before I realised that it did not have the character I thought the site should have. In the end I dropped the design but used the cat element as a greeting card design. This was followed by a design similar to the eventual design, but one for which I was unable to find a satisfactory solution. This group of designs illustrates the problem with trying to find a way of joining the line of the inside of the tail to the paw. Eventually I thought that it would be better to find a different way of producing a circular logo, settling on the design at the top of the page. These two designs have been used from time to time. That on the left is a simple recessed lettering style while that on the right followed the popularity of three-dimensional glass-type designs and incorporates a reflection of me in an effort to make it appear more realistic. That on the right is particularly weak and not very successful, though both were valuable as design exercises. There are two points to make here: firstly, that it is useful to test different designs and, secondly, that it helps to have a specific aim in mind if you are to achieve a sensible and lasting design. These two logos are based on the simple juxtaposition of my initials, JL. and are some of my oldest attempts to produce a personal logo. That on the left seems to work better at larger sizes though that was not intentional. Luckily the initials are able to form a simple, mirrored, design and so change almost every time I use them. The logo on the right has been used for some time, and at a smaller scale, on my personal stationery. Looking at it now I can see that it is time to update its rather dated appearance. Every now and again it helps to look at some of the work you do and attempt to review it from a different perspective. In the case of these three studies, literally. As I must have explained elsewhere, a logo should not be designed in the abstract, but be produced as the resolution of a number of design objectives that incorporate a variety of business or personal requirements. But as I don’t have these to worry about I can only look at these personal logos in the abstract. In that sense, they lose the immediacy required of a logo and, perhaps, some of the energy required of the designer. They certainly don’t have the simplicity that is usually the mark of a good logo design. The rationale behind the three sketches was to take a quick look at a two-dimensional representation of a three-dimenstional object formed of two letters. The first is not at all well designed but the principle of having a solid sculpture of two letterforms joined at right angles is interesting and is likely to be developed, perhaps more on the lines of the second sketch. In many ways they are better than the lower logo, though that is more attractive as the straight and solid lines create interest, and it can be viewed as a more realistic object, something such as a pool, perhaps. Mind you, the colour also helps. The three exercises above give some indication of ways in which the initials ‘JL’ might be arranged to create a three-dimensional design, but there are other ways, although with legibility issues. Here is an exercise to organise them into an impossible three-dimensional arrangement. The two initials are used linked, and with them sloping alternatively to the left and to the right. Note that, on the left hand example, the ascender of the ‘L’ is truncated. Logos are, in many ways, the most obvious face of companies; the image by which we identify them. However, there is considerable design thinking that will have gone into the overall presentation of the company in its widest sense, bearing in mind not only its presentation to its public audience, but also within itself. In fact, the logo and associated design work can be argued to be better informed if it is to come from the people who work within the company, in that they are best placed to present themselves. In addition, having designs come from them has the benefit of helping to bond them. Conversely, having designs forced upon them can often alienate; one area where this is notoriously true is in the design of uniforms. It is important that there is consistency in the presentation of the many aspects of the company’s operation. One of the areas that interests me is the design of corporate documents, in particular, the design and layout of house styling for companies. The first of these three illustrations to the right is a double spread from a document which set out all the visual aspects relating to the production of the company’s documents, both in-house as well as for external consumption. It may look a little dated now as it was carried out in the 1990s using the then capabilities of the standard word processing programme of that era, and the Mac platform. Working for a newly formed organisation with individuals of different nationalities, backgrounds, training and levels of expertise it was imperative to produce house documents that had a common look to them, again both for internal and external consumption. 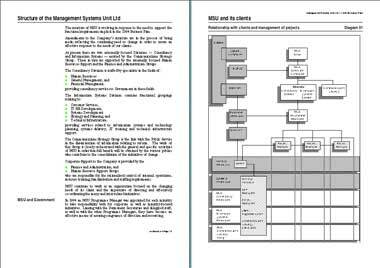 In this particular case the house style document also dealt with many of the issues relating to the use of the standard software for those who were unfamiliar with them but were required to use them in their day-to-day work. 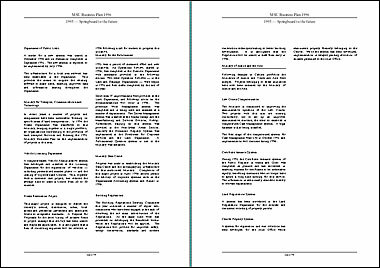 The document was produced for both the Mac and PC platforms to ensure that documents could be prepared jointly on both platforms as well as maintaining a common appearance. It was designed to give instruction in a number of areas that were considered mandatory, while allowing a degree of flexibility in others. The lower two illustrations of the three above are two double spreads from two different documents which had to retain a very similar appearance. They show the use of illustration as well as a decent balance of white space. Bear in mind these were all produced in the most common editing programme, and that it was important to be able to give people with little experience of design work the ability to assemble a relatively decent looking document. 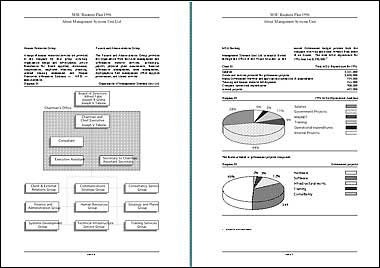 Here we have something rather different, an attempt to have a document – in this case one of the company’s business plans – demonstrate an extremely simple face to the outside world. In retrospect I think it could have been a little bolder but it seemed to reflect the mood at the time and was an elegant front page. Bear in mind that documents like this also depend upon the quality of the materials from which they are made and must be considered at the same time that the typography and design character are being decided upon. 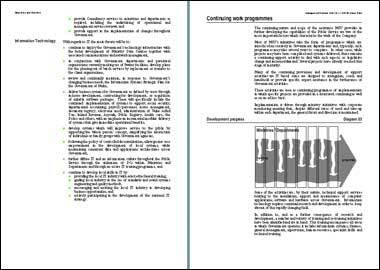 Below it are two more double spreads taken from the same document and illustrating the form of the layout dealing with the background and introduction to the business plan. Looking at it again I believe that the line in the footer could have been left out for better effect, and that the graphics could have been improved, especially by allowing more white space between body text and titles and, perhaps, by increasing the size of the heading type. However, bearing in mind that the document was produced with simple software tools and relatively inexpensive materials, I believe it was a reasonable response for the time and seems to have been well received. One thing I notice looking at these pages again is how much I still dislike the duality of the even-numbered columns on a page, but I have written about duality and its effects elsewhere so won’t repeat it here. I very much prefer an odd number of columns – one, three or five – to avoid the natural emphasis where the eye focusses on the central, blank gutter. While it would be unreasonable to have five columns on a portait A4 page, I believe that three is practicable provided the type face and leading are sensibly chosen. Leading, for those unfamiliar with the word, is essentially the vertical spacing of lines of type. If there are not to be three columns, then a single column perhaps sized to optimise line length would be the simple solution and is, of course, the most common. Finally, here is another document, a study for an Annual Report. 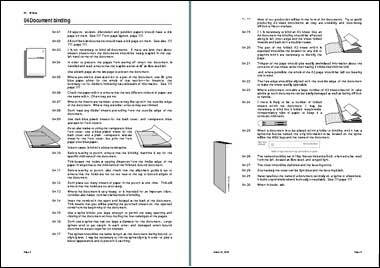 The document is a double spread with gutters in which headings, sub-headings and breakouts are and can be located. 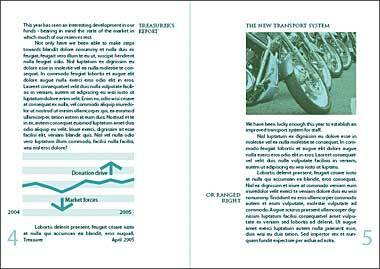 Its type is a dark blue-green to demonstrate both a reflective as well as a medical character, and the type is larger than may be usual in order to make the document more accessible to a wider audience. This latter issue is a difficult one to determine as readability is dependent upon a number of factors, not just size. Most designers will design there own stationery, if not all designers. This will change over a period of time as well as, perhaps, with the type of person to whom the stationery might be addressed. It does not, for instance, make sense to write a letter to your grandmother on the same type of stationery that would be sent to a potential or actual client. 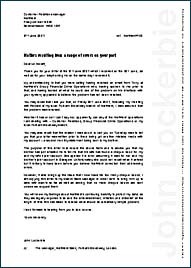 This is an example of a letter heading I use to write to non-design clients. 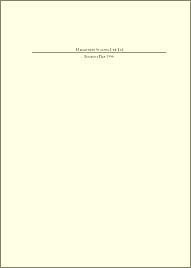 It presupposes that the letter may be held in a file on its left-hand side so my name and address are prominently located on the right-hand or open side of the letter and file. My reference is also on the right but there is no reference for the addressee and the address and date are on the left. It might make sense also to locate both their and my references as well as the date on the right-hand side of the letter for the same reason, though their address could be kept on the left. I like to use fonts at large sizes as strong elements of a page. With documents such as invoices, it is important that people understand what they are receiving. Here I was asked to provide a simple invoice design. The user’s address runs along the top of the letter with the addressee and date on the left below it. The reference is at the right. The reason I don’t worry about providing a place for the addressee’s reference, is that my experience is that all companies have different ways of attaching their reference. This is particularly so now that many companies scan all paper documents, referencing them only then. Where they don’t scan them, they tend to write a reference by hand in the top right hand corner. Here there is a suitable space for such a reference. 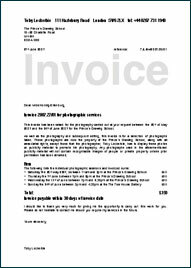 I should also mention that the word ‘Invoice’ is grey scale, enabling it to be used on black and white printers or colour.